The DPA, a non-profit organization that promotes education and awareness of digital pathology applications, has selected the keynote and plenary presenters for Pathology Visions 2016, the annual conference of the DPA. This year’s conference will feature Ulysses G.J. Balis, MD, FCAP, FASCP, FAIMBE of the University of Michigan Health System as the keynote presenter and John Pfeifer, MD, PhD of the Washington University School of Medicine as the plenary presenter. 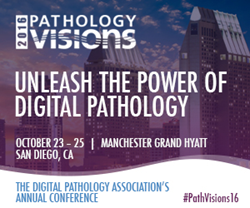 Pathology Visions 2016 will be held at the Manchester Grand Hyatt in San Diego, California on October 23 – 25. Dr. Balis is professor of Pathology at the University of Michigan and currently serves as the director of the Division of Pathology Informatics, in the Department of Pathology. He is a board-certified Pathology Informaticist, with longstanding interest in the intersection of computational approaches and the practice of medicine. This division he directs is noteworthy for being one of the few such academic information technology divisions operating in support of pathology while being housed wholly within the pathology department itself. Dr. Balis’ keynote address, Making Good on 30 Years of Hype. Digital Pathology Finally Comes of Age., will take place Monday, October 24, 2016. This presentation will provide salient history of this field, followed by a series of deep dives on how Digital Pathology is likely to be adopted for use in primary signout settings in the very near term. Emphasis will be placed on use cases where this technology can offer solutions that are simply not possible with use of conventional microscopy-based workflow alone, including: image-based analytics and informed detection, productivity tools, real-time asset tracking, collaborative practice and finally, workflow models. As the final segment of this presentation, an overall adoption model will be explored – one in which there can be no doubt that Digital Pathology has truly come of age and is ready for the task at hand. Dr. Pfeifer’s presentation, WUPax: Valuing Diversity, is scheduled for Tuesday, October 25, 2016. Dr. Pfeifer is Vice Chair for Clinical Affairs in the Department of Pathology at Washington University School of Medicine. He is a Professor of Pathology and is board certified in Anatomic Pathology and also Molecular Genetic Pathology. Dr. Pfeifer has been a practicing surgical pathologist for over 20 years, and as Vice Chairman for Clinical Affairs is responsible for managing the Department’s high-volume, high-complexity Clinical Pathology, Anatomic Pathology, and Neuropathology Divisions. If interested in joining these thought leaders and providing your own expertise at this year’s conference, click here to submit an educational proposal. Submissions will be accepted through June 6, 2016. Don’t miss your opportunity to have direct access to thought leaders and pioneers in the ever-evolving field of digital pathology. The Early Bird registration rate expires July 29, 2016. For more information about Pathology Visions 2016 and to register, click here. Become a member of the DPA and save an additional $200 off your registration. Click here to join today. About the Digital Pathology Association The Digital Pathology Association, located in Indianapolis, IN, was founded in 2009. Its mission is to facilitate education and awareness of digital pathology applications in healthcare and life sciences. Members will be encouraged to share best practices and promote the use of technology among colleagues in order to demonstrate efficiencies, awareness, and its ultimate benefits to patient care.